SACRAMENTO, CA -- At a rally in Sacramento this afternoon, Assemblymember Miguel Santiago (D-Los Angeles) announced AB 1784, which aims to establish an Open-Source Paper Ballot Voting Systems program. The measure, joint-authored by Assemblymember David Chiu (D-San Francisco), Assemblywoman Lorena Gonzalez (D-San Diego), and Senator Scott Wiener (D-San Francisco) sets aside resources to help counties update their ballot voting systems to ensure security and transparency in elections. "There is no greater threat to the integrity of our democracy than foreign powers working overtime to hack their way into our voting systems," Assemblymember Santiago said. "AB 1784 is our opportunity to earn voters' trust by kicking private corporations out of our elections technology and embracing a totally open-source system that we can secure on our own." Assemblymember David Chiu, Assemblywoman Lorena Gonzalez, and Senator Scott Wiener also made bold statements in support of the "Secure the VOTE Act." "Ensuring the integrity of our elections is one of the most fundamental jobs we have in government" said Assemblymember David Chiu. "ABÂ 1784 will create a pathway towards the transparent, open-source voting systems that we need to protect our democracy"
"Open source election technology will ensure no single corporation monopolizes the methods we use to improve our electoral transparency, security, and accuracy," Assemblywoman Gonzalez said. "This tool will allow the many eyes of experts and the public to test our systems and catch flaws." "With California's Presidential primary less than a year away, and the 2020 general election right around the corner making sure our elections are secure and transparent is more important than ever," said Senator Scott Wiener (D-San Francisco). "We need an open-source paper ballot system that will restore the voters' trust. 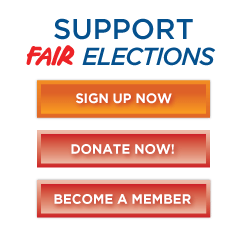 Our democracy depends on keeping our elections open and fair." Trent Lange, President of the California Clean Money Campaign, is sponsoring AB 1784. He said, "At a time of crisis of confidence in our election systems, we need more secure and transparent voting systems to replace the insecure secret software from proprietary vendors being used today. That's why we applaud Assemblymembers Santiago, Chiu, and Gonzalez for introducing the 'Secure the VOTE Act' to allow counties to develop, certify, and create governance for publicly owned open-source paper ballot voting systems." California's voting systems are aging, and many counties throughout the state have been required by the Secretary of State to replace systems that no longer meet the California Voting System Standards. ABÂ 1784 would provide up to $16 million in matching funds to help those counties overhaul their voting systems quickly and effectively -- so long as they use open-source paper ballot voting systems. Voting systems that use technology owned by private corporations are frighteningly vulnerable to security threats. Open-source systems would be openly licensed and therefore open to public inspection, and don't come with corporate hurdles to security. Any attacks would be far easier for counties to recognize and defend. The bill is currently in the Assembly Committee on Elections and Redistricting. Assemblymember Miguel Santiago is the Chair of the Assembly Communications and Conveyance Committee, and a member of both the Assembly Public Safety Committee and the California Latino Legislative Caucus. He represents the 53rd District composed of the cities of Los Angeles, Huntington Park, and Vernon.